Don't think I follow your question - do you mean audit information about ALL changes made to a system, or something more specific? It's regarding change management part, i am looking for a table which holds the logs for all the changes carry out the Fin/ HR module (i.e. customization ). 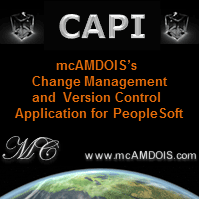 also like to know other options at configuration level, to configure the People Soft to capture the same logs. Unfortunately auditing in PeopleSoft is set up manually, and will depend on what has been delivered by PeopleSoft, and any custom auditing implemented in the system. This article on the wiki goes through the process of finding out what is audited and might be a useful reference. Beyond that, there may be database level auditing that could be implemented/useful.